I actually had not seen many of the early episodes of the series in high-definition before receiving the Blu-rays, so rewatching the series was a visual treat. I don’t have a 1080p television, and I don’t have an elaborate sound system, but the show still looks gorgeous and I would recommend this as a great way to experience the show for the first time or with a new set of eyes depending on how you watched to begin with. However, I don’t necessarily want to focus on those factors given that I’m sure others are in a better position to analyze transfer and other such things. Instead, I want to consider this set in terms of what it offers to different audiences. Those audiences, most broadly, are non-readers and readers. For the former category, there is a clear effort on the set to provide background information and details that some might have found confusing within the series. There’s an in-episode guide feature on the Blu-ray that allows you to get details about the characters on screen, the history they’re referencing, and where the scene is taking place – it’s clearly designed to speak to those who may have had trouble following the various divergent narrative threads and the large number of characters – or, in other words, it’s clearly designed for non-readers. There are also versions of the various maps and character guides that were also available online while the show was airing, all consistent with HBO’s desire to support those who needed some background information to keep things straight. However, the set doesn’t necessarily leave readers in the lurch, particularly with a collection of histories that were written by staff writer Bryan Cogman and given a compellingly rendered, hand-sketched, rudimentary animation treatment in addition to voiceover recorded by actors from the series. These have a clear function for non-readers: the histories sketch out the detailed mythology that the show was only able to hint at through exposition, letting them into some of the depth of Martin’s world without necessarily giving them all of the information (which could be gleaned by reading the books, which are not the lightest of reads). For readers, meanwhile, they get to see parts of Martin’s books that didn’t make it to the screen become a part of the discourse around the series, valuable both in the sense that they get to enjoy them personally and that non-readers will now have access to some of this information (thus exposing them to more of Martin’s world, which most readers would suggest is ideal to get the entire scope of the story). The other features on the set are of a similarly high quality. The audio commentaries – seven in total – are really enjoyable, featuring a majority of the cast having a whole lot of fun discussing the episodes and playing off of one another. There are also some Blu-ray exclusive features like “Anatomy of an Episode,” which delivers picture-in-picture production details into “A Golden Crown” and shows off the potential for integrative Blu-ray experiences. Meanwhile, the episodes themselves stand up extremely well, and I greatly enjoyed revisiting the entire season and find myself more excited for the second season as a result. These discs in no way damage my opinion of the series, and it is a worthwhile investment for people watching for the first time or fans who want access to the episodes with some additional material attached to them. And yet I don’t know if this set is really what I wanted from the series. To be clear, this is far beyond a bare bones treatment, so I’m not suggesting that what is here is wanting: given the desire to create a “quality” box set which appeals to both readers and non-readers, I really think that this is pretty unimpeachable. However, as someone who comes to this series as a fairly casual fan of the books, a reader without necessarily being a superfan, there are moments where I wanted the Complete First Season box set to give me something more substantial regarding the process of adaptation. Without faulting what is present, I did find that I wanted an entire set focused on the translation from book to screen, explaining both the subtle and substantial changes that took place in the process. This is not because I was necessarily disappointed with the adaptation involved: I am completely open-minded, and there is little within the series that I would be unwilling to see adjusted if it better served the television narrative being constructed. However, my experience with the show was one very much shaped by the nature of its adaptation, and that was an experience this set is very rarely interested in exploring. A feature entitled “From Book to Screen” talks about the vague challenges of adaptation, but largely boils down to “This could only be done on HBO,” a line I’m sure the channel loves to hear but doesn’t actually tell us anything about how it was done. The audio commentaries are an area where you are expected to find some of this, and there are various moments where the writers (David Benioff, D.B. Weiss, Bryan Cogman, and George R.R. Martin himself) and even some of the actors speak to the relationship between the book and the film. However, what I found interesting was how rarely they engaged with the question of “Why?” Martin’s commentary on “The Pointy End” comes to the closest to pushing this question, but he actually doesn’t have any answers: when he points out that a line he quite liked from the book and his initial script is missing, there’s no one there to answer him, and the commentaries never open up into a dialogue about how specific characters were conceived relative to their literary counterparts. To be clear, I understand why they’ve chosen to go this route. There is a clear desire to separate these two entities, to see them as siblings more than versions of the same story, and this will become more apparent in the second season when more characters are missing and further liberties are taken. To include too much reference to the books would be to acknowledge that interrelationship more readily, and I do think HBO and the producers are explicitly moving away from that relationship in any way possible. This doesn’t meant they aren’t going to evoke Martin’s histories, or that they’re going to dramatically diverge from the novel’s plots, but a specific comparison between the two media does seem to be something HBO is uninterested in exploring within official releases connected to the series, especially given that this set has to appeal to both sides of the audience binary (and sell the show to new viewers, providing new subscribers and justifying future seasons). Perhaps I am being unreasonable in this desire, particularly as it relates to television DVD projects. While there can be a degree of self-reflection with a Complete Series release after a show has concluded, Game of Thrones is still a work-in-progress, and acknowledging the process of production might call attention to flaws that the show is unwilling to explore. To the credit of the writers, they are willing to point out some of their small mistakes, and Bryan Cogman even offers some thoughts on the online conversations about “sexposition” (a term that I coined and which has gained remarkable traction) in the commentaries that suggest a degree of self-reflection. However, the bonus features on the whole ended up feeling incredibly glossy, reflective of the final product more than the messy in-between period. While I know why it’s not on the DVD, I’m disappointed we hear only vague conversations about the original pilot shot by Tom McCarthy with different actors in the roles of Catelyn and Daenerys – in fact, I’m even disappointed we don’t see any of it, although that’s likely a wildly unreasonable expectation. I’m disappointed that the casting process, which was apparently so challenging, is buried in cleverly-named “Dragon Eggs” as opposed to a prominent part of the discourse surrounding the show in the bonus features. Effectively, the narrative that gets elided by the “official” narrative of the production is the narrative that I wanted to see brought to the forefront, a different narrative than the one featured on the Making Game of Thrones blog or in the network’s In Production segments featured on the site. The problem is that this box set, and box sets in general, aren’t necessarily designed to extend the text into a new area. While the set offers plenty of value, it is value primarily invested in reinforcing the quality aesthetics of the series rather than demystifying and deconstructing those aesthetics by providing a deeper look into the intricacies of the production. That doesn’t make this a bad box set, and I guarantee it will sell tremendously well and, perhaps most importantly, sell the show particularly well to old and new viewers alike. There’s just part of me that, despite its quality, wishes it was selling a different product (or, in this case, process). The Complete First Season Box Set is available everywhere today, but Amazon has it for $35 on Blu-Ray and $30 on DVD, which is far less than it is worth. 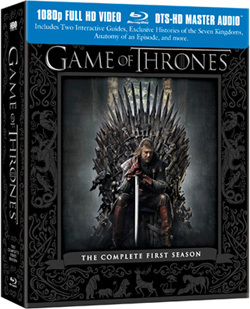 The HBO Store also has the set at 20% off with an exclusive bonus feature. I would likely think that, with regards to some of the more controversial content in the show, it might be considered biting the hand that feeds them to include the info on whether they increased or decreased the amount in the story. Granted though within the show they aren’t really concerned with making any statements either but like you said expanding on the shows aesthetics. None of the scenes added, such at Renly’s scene with Loras, really add to the story. Renly isn’t portrayed as gay to make some statement, but because Martin heavily hinted at this truth in the subsequent novels. It’s a credit to their writers that they manage to integrate the original scenes into the show so well. Ostensibly I think the Game of Thrones world is 99% of Martin’s world. Miles, I completely understand this sentiment, but what TV video releases really do offer the gritty details of production (the difficulties, as you say)? I’m looking over at my DVD shelf and few are coming to mind. I have never heard a showrunner explain EXACTLY how their writers’ room works, presumably because nobody wants to risk offending their coworkers. One of the only showrunners in the business with even an ounce of honesty about the creative process is Dan Harmon of Community. These days, I watch the show not because I love the show that much, but because I respect Harmon’s openness about production challenges and willingness to admit failures, and want to keep supporting his work. Super Sweet Page You Made Here.. Very Educational Subject For A Blog Keep Up The Great Work!. Check Out Winnipeg Computer Repairs Master Blogspot Blog And Tell Me What You Think! !